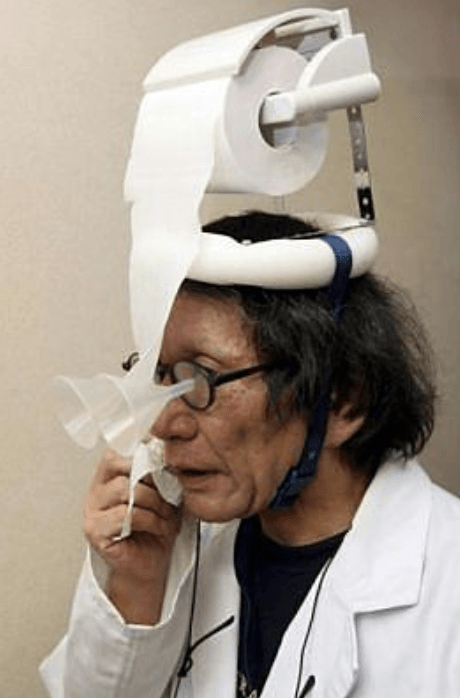 Chindōgu is a prank originating from Japan, which is done by a person seemingly inventing ingenious everyday gadgets that seem like an ideal solution to a particular problem, but are in fact nothing more than a useless gag. The term, originally coined by Kenji Kawakami, means “unusual tool,” and is a form of Japanese art. Created in the 1980s, Chindōgu are inventions that are designed to solve everyday problems, but are far too odd and eccentric to use regularly. A Chindōgu Cannot be for Real Use—They must be, from a practical point of view, useless. 2. A Chindōgu Must Exist—A Chindōgu must be something that you can actually hold, even if you aren’t going to use it. 3. There must be the Spirit of Anarchy in Every Chindōgu—Chindōgu inventions represent the freedom to be (almost) useless and challenge the historical need for usefulness. 4. Chindōgu Tools are for Everyday Life— Chindōgu must be useful (or useless) to everyone around the world for everyday life. 5. Chindōgu are Not for Sale— Chindōgu cannot be sold, as this would go against the spirit of the art form. 6. Humor is Not the Sole Reason for Creating a Chindōgu— Even if Chindōgu are inherently quirky and hilarious, the main reason they are created is for problem solving. 7. Chindōgu are Not Propaganda— Chindōgu are, however, innocent and made with good intentions. They should only be created to be used (or not used). 8. Chindōgu are Never Taboo— Chindōgu must adhere to society’s basic standards. 9. Chindōgu Cannot be Patented— Chindōgu cannot be copyrighted or patented, and are made to be shared with the rest of the world. 10. Chindōgu Are Without Prejudice— Everyone should have an equal chance to enjoy every Chindōgu. Culture jamming(sometimes guerrilla communication) is a tactic used by many anti-consumerist social movements to disrupt or subvert media culture and its mainstream cultural institutions, including corporate advertising. A form of political and social activism which, by means of fake adverts, hoax news stories, pastiches of company logos and product labels, computer hacking, etc. draws attention to and at the same time subverts the power of the media ,governments, and large corporations to control and distort the information that they give to the public in order to promote consumerism, militarism, etc.